First, let me preface this by saying that I, personally, do NOT like trying to slap "full" wave counts on waves like this one. Why? Because doing that causes me to start playing for a change in trend, and in this case, we don't need to anticipate a new trend! We KNOW what the trend is: It's up. And we've known that since early January. Attempts to "anticipate a trend change" lead to only one thing: BUCKING the trend. Can that be a good thing? At times, absolutely and of course, and some of my biggest winners have come from that very thing -- but there's a time and a place for it. During waves where we are (or should be, if we're humble) significantly uncertain of the wave's primary intentions, then attempts to "anticipate" frequently lead to quitting the trend too soon -- and/or flipping short and losing money. That's the reason I haven't published full counts on the entire wave off the December lows. I learned a long time ago that's a losing strategy UNLESS you have a solid idea of what the wave wants to accomplish. And sometimes we do have that solid idea. But in this case, almost from the beginning, I made it clear that I didn't know what the wave wanted to accomplish, so I stopped publishing counts that could encourage poor trading. Of course, I'm sure some places thought they knew exactly what this wave was from the beginning -- but how did that work out for them? I know my approach frustrates some people and they just want "wave counts already!" -- but there's a time and a place for wave counts... and then there's a time to simply flow with the market like a raft on a river. "I've got it all figured out" wave counts have their place; but during waves that could be "any number of things" (especially waves that trend higher into new price territory, where you have no point of reference to work from) presuming one knows more than they actually do can lead to anticipation of an ending that never comes. So for folks who want the market to follow their "ideas" of what it "should do," instead of flowing with the market and aligning with what IT wants to do, there's [those guys]. I will never be like that. Using the current rally wave as an example, here's the thing: If this wave is going to make new all-time-highs (and, of course, it may or may not) then there's no TECHNICAL RULE that says it can't run another few hundred points unabated. There's only SPECULATION that it will or won't. It might even be well-reasoned speculation. But speculation isn't technical analysis; whereas wave counts should at least attempt to be. In my view, this is where most similar services fail time and again: They mistake their speculation for some sort of technical read. 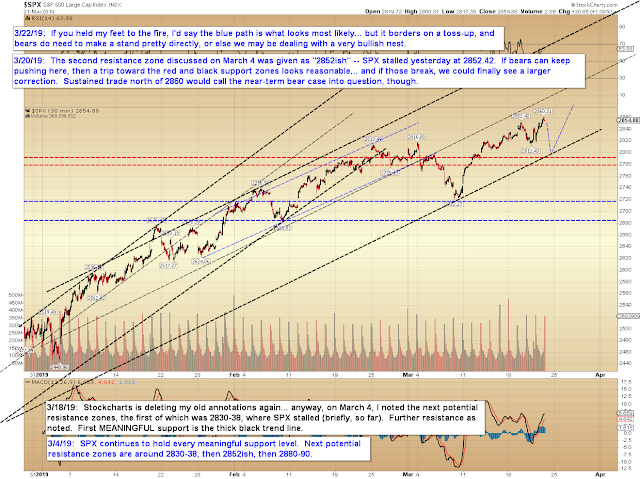 As I said, there's a time and a place for that, and Elliott Wave Theory absolutely can and WILL give you DETAILED technical reads unlike anything else (IMO) -- but it will only do so when the market has created a fractal structure that allows rules to impact that structure, which can then "lock" the market into certain predictable behaviors. But in a case like the current rally (as I said), there are no predictive "rules" that HAVE to be honored if it runs to new highs. Once it hits a new high, there are only guidelines, inflection points, and wave counts that may or may not consider things like extended fifths that could materialize -- but there's no "rule" that says it HAS to stop at X price point. Thus, unless the move is spelled out in the charts relatively clearly (like it was with the recent expanded flat), I'm content to simply ride the trend during vague waves like this, at least until I see an impulsive decline come along. This was the same approach I took for the entire latter portion of 2017, during that huge extended fifth rally. Meanwhile, everyone else was trying to "anticipate" based on where THEIR count said the wave "should" end, and those people were calling tops left and right while the market barreled over them. But worse, as a consequence, they ignored what the MARKET was saying, in favor of what their own little numbers and letters on a chart said. And they missed hundreds of points of profit. Almost every day for months, from September 2017 until the first portion of January 2018, my updates amounted to "still looks pointed higher," and some people got frustrated with that. Yet when that wave actually DID end, we were on top of it immediately. So, like my madness or not, there is a method to it. Anyway, that's my philosophy during waves like this. Let the market tell us when it's REALLY done. And it will; usually loud and clear. 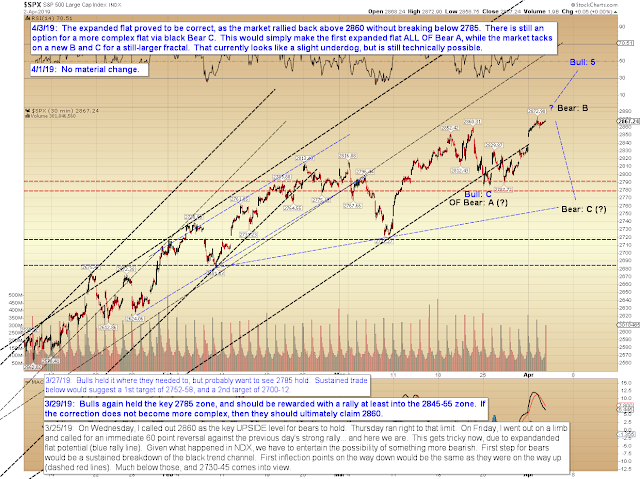 All that to say: THAT'S why I haven't been showing counts trying to break down the whole thing since the December low. 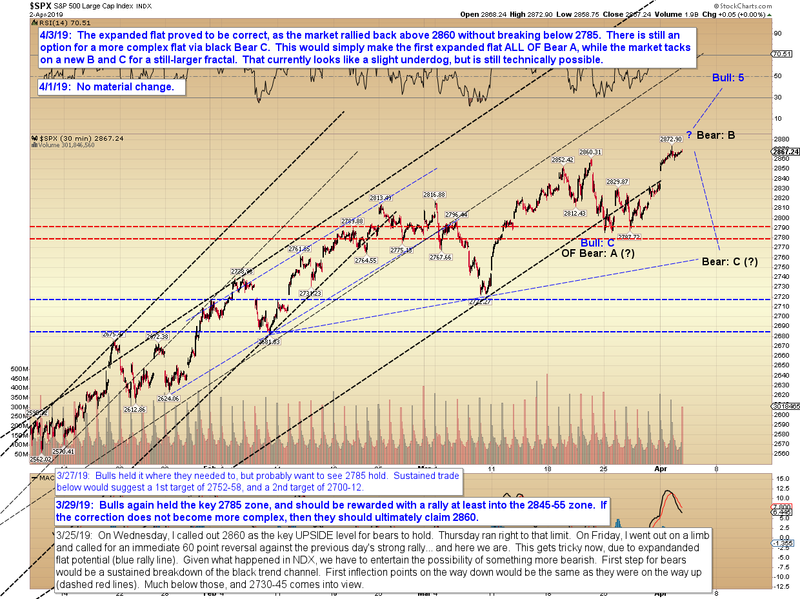 In conclusion, my expectation of a minor, but scary, decline followed by a reversal back above 2860 proved to be correct. We're now into territory for another inflection point, so if we begin to see impulsive declines, we'll stay alert to a more complex flat. Trade safe.